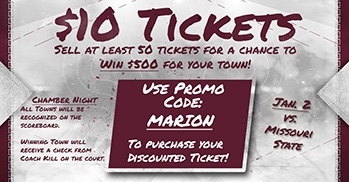 Description: Show support to SIU Basketball and your local chamber of commerce! We are competing with other regional chambers on a special promotion surrounding the Mayor's Cup game on January 2nd. Use the code "Marion" at check out, and it will put us in the running. The chamber with the most tickets sold will get recognition at the game and $500 for our local community!! Tickets are available at www.siusalukis.com/tickets.